This coffee will be fresh roasted for you. We expect Ceremony Coffee Roasters will roast and ship this coffee in 1-2 business days depending on their roasting schedule. 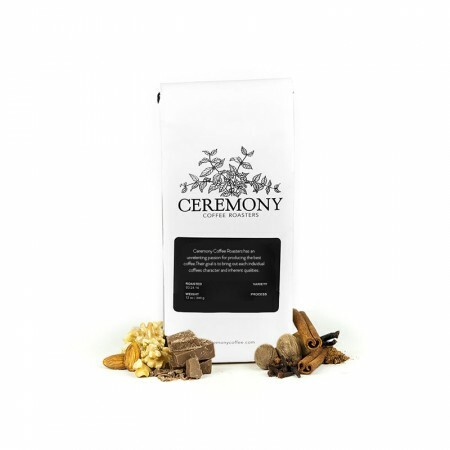 The Brazil Pereira was carefully roasted for you by Ceremony Coffee Roasters. Grown by the Pereira Sisters in the Carmo de Minas region at 1,300 meters, this pulped natural coffee is a perfect example of why we love coffees from Brazil. This coffee has rich and creamy notes of a peanut butter cup and that perfect corner piece of brownie. I was really drawn in by the listed tasting notes. Strong work whoever came up with them. Unfortunately, despite multiple adjustments with both chemex and french press I just could not dial in those notes very well. Could be my fault. A good coffee. Just wasn't what I was expecting bases on the tasting notes. 3.5. Very nice coffee, The peanut butter cup aroma was surprising and tasty. Sound recommendation. Classic low acidity Brazilian with the aforementioned peanut butter aroma. I would buy this again.